Backyard Autumn Nighttime Skies Over New Jersey. 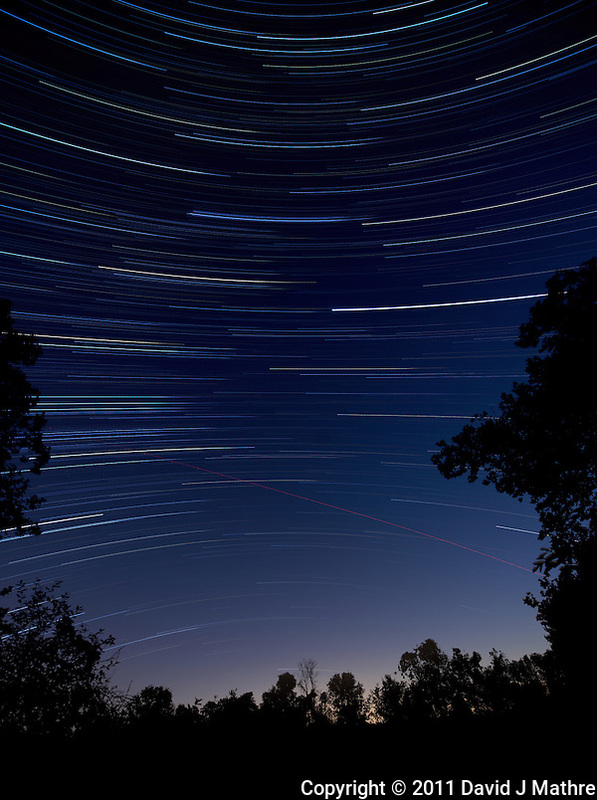 Early Early Morning Star Trails. With the continuing clear skies, I set up two cameras to record star trails early this morning. I started at 3:00 AM after the moon set. I was still worried about condensation on the lens. I pointed a Nikon D3 camera with a 16 mm f/2.8 fish-eye lens north, and a Nikon D3x camera with a 14-24 mm f/2.8 lens at 14 mm pointed south. I used some gaffer tape to prevent the focal length lens creep on the 14-24 mm lens that ruined a previous star trails session. The Nikon D3 camera stopped recording after 2 hours. After the fact, I realized that I used a EN-EL4 rather than the higher capacity EN-EL4A battery. The D3x camera with a EN-EL4A battery ran until I went out to get the cameras at sunrise. Unfortunately, condensation on the lens started distorting images after about 5 AM. 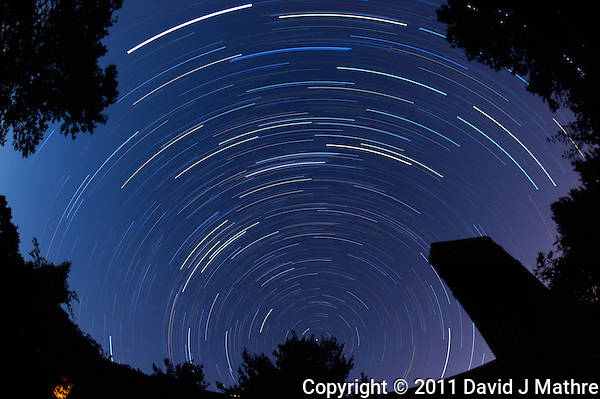 Both the North and South facing Star Trails ended up about 60 images (2 hours). The really bright trail in both the Northern and Southern view is Jupiter. 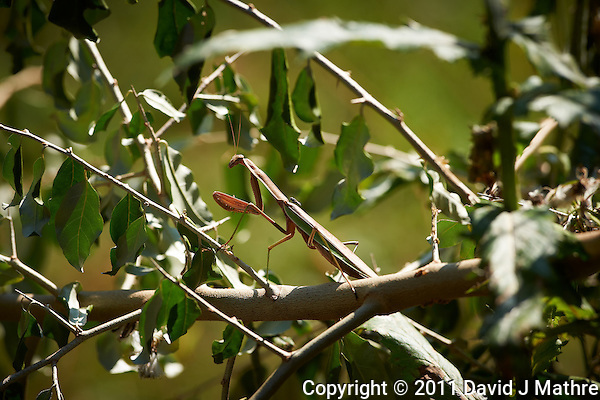 I saw this Praying Mantis climbing a weed off my back deck. 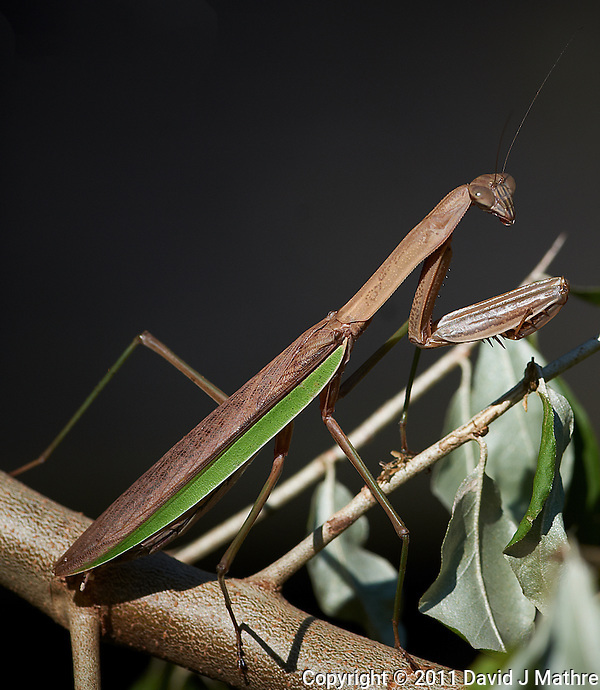 I initially tried to get some images with the camera & telephoto lens at hand, but the minimum focus distance for the 600 mm f/4 VR lens is ~ 17 feet. 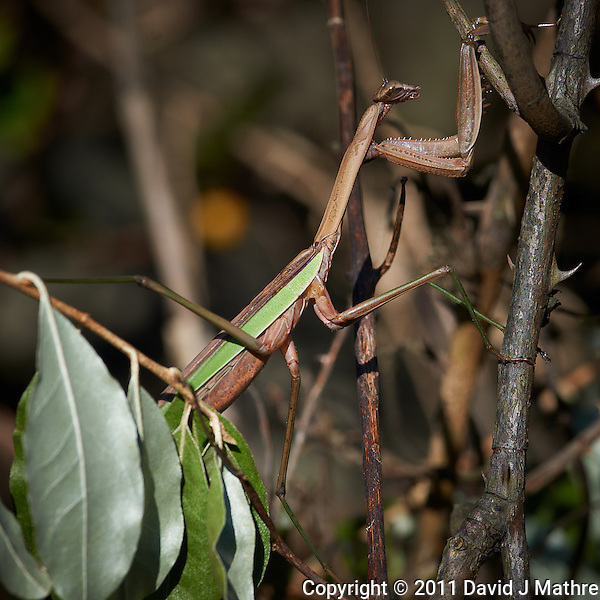 I switched to a 300 mm f/2.8 VR lens, with a minimum focus distance of 7 feet. 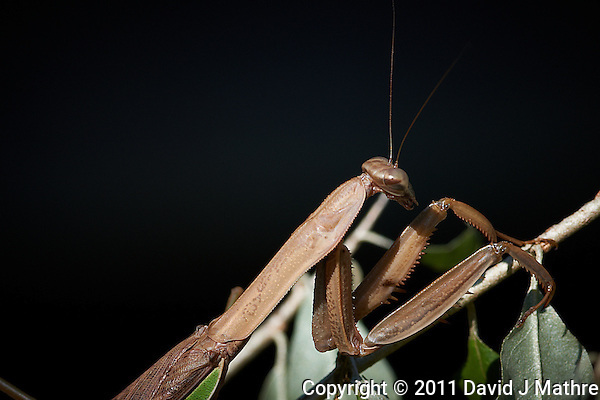 When viewed close up, the Praying Mantis looks deadly. 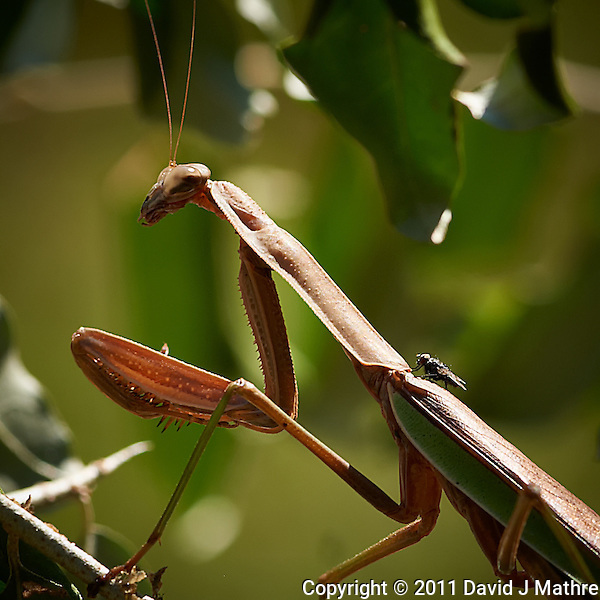 There was a black fly that kept landing on the back of the Praying Mantis. I guess the fly knew where the safe zone is. 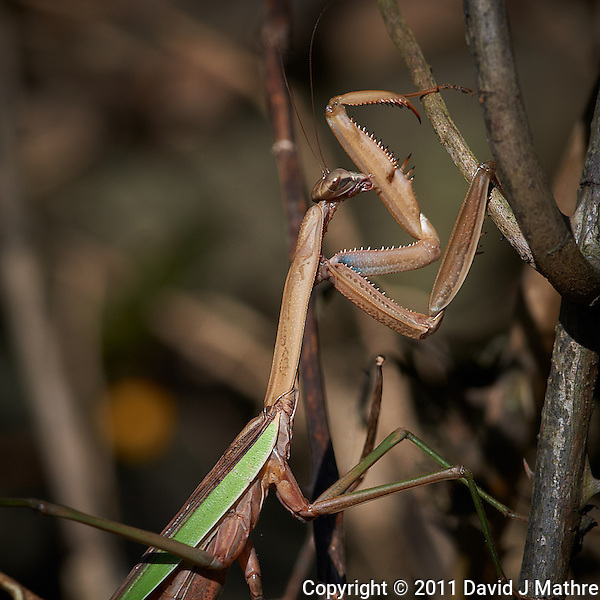 Ultimately, I think the Praying Mantis got tired of me, and moved further into the shrubs.